Some say the Italian-car tweakers at Novitec are masters of overkill. Eyeballing a typical Novitec job, they'll remark, "If Ferrari wanted the F430 to have twin superchargers they'd have have had God install them when he came to visit the Pope." But Novitec is undaunted by such purism. 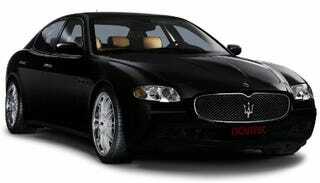 Nonetheless, their latest is a tasteful semi-mod of the Maserati Quattroporte. No breathing apparatus has been bolted on, just an ECU hack that raises the rev-limiter ceiling to 7,800 rpm, which — through the miracle of chaos theory — affects a power boost from 400 hp at 7,000 rpm to 413 hp at 7,100 rpm. Torque is effectively raised to 345 lb-ft at 4,650 rpm, from 332 lb-ft at 4,500 rpm stock. An application of twin adjustable shock absorbers — in stainless steel, natch — comprises the extent of handling tweakage. At the ground, stainless-steel exhaust tips and 20-inch multispoke rims under 245/35 Pirelli P-Zero rubber at the front and 285/30 make up the entirety of added cosmetics. Notwithstanding a lack of performance figures, the net effect is something between country club in Westport and hip-hop club on the far west side. We approve.